We offer nine portfolios to help your clients meet their specific investment objectives. 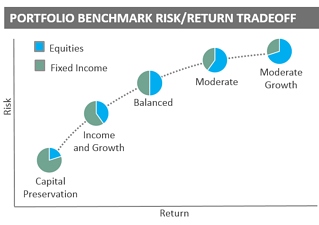 Each portfolio is constructed using a risk management approach that seeks to add value through both dynamic asset allocation and manager research. 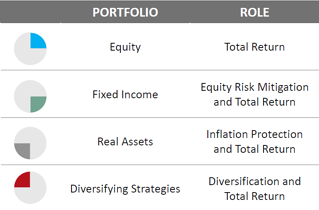 Addressing unique risk factors, we offer four stand-alone category portfolios: global equity, global fixed income, real assets, and diversifying strategies. We also offer a series of core portfolios. These portfolios offer another level of diversification and oversight with a dedicated portfolio management team. All core portfolios are dynamically managed, actively adjusting to market conditions. As an advisor, you may assemble portfolios that allocate to all four category portfolios, or you may elect to supplement an existing portfolio with an allocation to just one category.